I'd like to thank you all for joining me. Be sure to add your wrap-up link below and please double check that your name is listed in the sign up/starting line linky at this post so you will be eligible for the giveaway. You will also need to fill out the form on the prize page if you would like to win a prize. You have until Wednesday, August 2 at 11:59pm central time to add your wrap-up link and to fill out the form on the prize page. I will draw giveaway winners in the following few days after the wrap-up deadline so keep a look out in your email inbox (or spam folder, just in case) for an email from truebookaddict. (Please be sure to note the system of drawing winners in the giveaway details on the prize page). Now let's have a big round of applause for the authors who so generously donated our prizes. Bravo...and thank you! Hope to see you next time at the MONTH LONG FrightFall Readathon, coming in October! The button is all ready to go! You can grab the code in the sidebar. As I mentioned previously, I'm going to ask for some help on future readathons by recruiting cheerleaders. If you're not familiar with the term, it basically means you visit participant's posts on their blogs, social media, in our Facebook group, and post words of welcome, encouragement and support. I've discovered that I'm having trouble keeping up on my own. I will do a call out post in early to mid-September on the blog so people can sign up/express interest...and I'll explain how it will work...once I figure out how I want it to work, schedule-wise. I also wanted to remind you of my upcoming Fall events at my other blogs. In September, during Banned Books Week, I do a week long series of posts. I'm not sure what my direction will be this year, but I do it every year and I don't plan to stop. That will be at my main blog, True Book Addict. At my horror blog, Castle Macabre I will once again be hosting Gothic September and then Season of the Witch in October. At Gather Together and Read, where the Never-Ending Anne Rice reading challenge is hosted, I will be hosting a read-along of The Mummy in October, in anticipation of the new book (the sequel, Ramses the Damned: The Passion of Cleopatra) coming out in November (written by Rice and her son, Christopher Rice). Lots of exciting doings coming this Fall. Fall and Winter are my favorite seasons! Thank you so much for joining me for the readathon. Good luck in the giveaway to all! Thank you so much for this readathon. 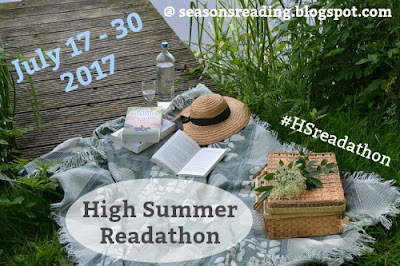 I did not post or contribute as much to discussion but this readathon helped me get out my funk! So thank you!!! Also, I LOOOOOOVE Anne Rice! I started following your other blog so I can keep a lookout for the read-a-long. It will be great to re-read The Mummy again. Thanks for another great RAT, Michelle! I didn't get a chance to get to my Christmas picks, but I am reading them this week. Maybe I should have started them earlier in the week! I think I'll do that next time, start my Christmas books in the second week instead of the last 48 hrs. I'm looking forward to your Fall activities! I have your FrightFall button on my blog already, and I can't wait for Gothic September and Season of the Witch as well! I've never read Anne Rice, so I'm hoping to join you for that. That's great, Darlene. So glad you will be joining in on the fall festivities! All done, I don't have a blog so hopefully I've done the whole linky thing right! Did really enjoy this, was good to be reading knowing others are joining in. Thank you, Michelle! I really enjoyed it as I always do, especially getting a chance to read Christmas books in the summer! Thanks for a fun Readathon! My first time and I will be back! Thanks for hosting the readathon, Michelle! I always enjoy your readathons because they are low stress. I'm glad you enjoy them, Randall!